We are pleased to launch the 2019 NSC prospectus. Should you wish to receive a copy of the prospectus, please click here. On behalf of the ASA NSC 2019 Organising Committee, it is our pleasure to invite you to participate in what will be the best NSC yet. It is expected there will be 1,000 anaesthetic specialists, pain medicine specialists, intensivists, trainees, associates and retirees all looking to learn and make new connections, in addition to 100 inspiring pioneers in the field of anaesthesia speaking for their specialities. WHY PARTNER / EXHIBIT AT THE 2019 CONGRESS? If you are interested in becoming a sponsor or exhibitor, please contact the ASA Senior Events Coordinator on +61 2 8556 9700 or via email at sponsorship@asa2019.org.au. 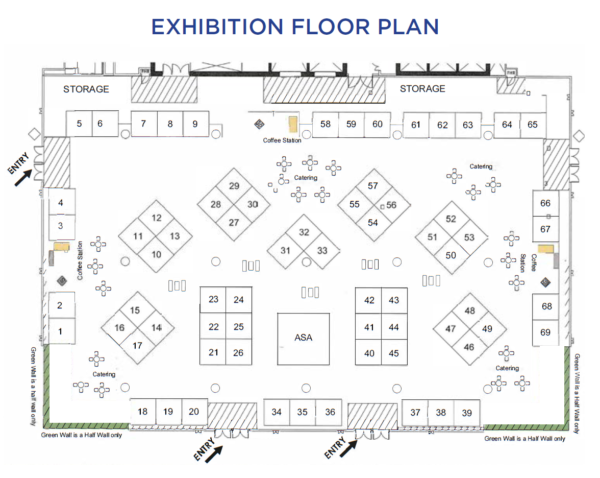 Please click the button below to download and view the Exhibition Floor Plan in full.